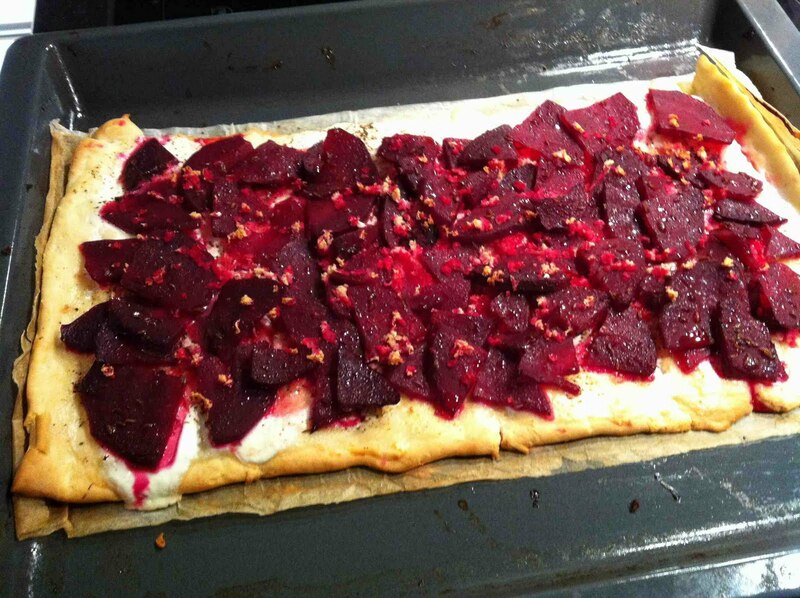 You can’t beet this pizza! I couldn’t help but think about my friend Walt when I made this pizza on Tuesday night. Walt’s an American ExPat in France. He writes a great blog with lots of posts on the wonderful food they cook and eat (here’s one for okra and tomato pizza). But Walt can (and does!) make a pun about pretty much anything. So when I thought about the possibilities for puns from this pizza (how do you beet this pizza), I had to think about Walt. My pun’s not perfect, but I am still learning from the master! Maybe Walt will add a pun in the comments! Here’s how I made the pizza. Christa had cooked and sliced the beets a couple nights before. After cooking, she marinaded them in oil, vinegar and caraway seeds (she had planned to use them in a salad). Instead, I made a pizza with them. I used (sorry to admit) roll out dough from the dairy case. First I pre baked the crust with a little olive oil and salt for about 10 minutes (I always find it necessary to pre bake these refrigerated pizza doughs). 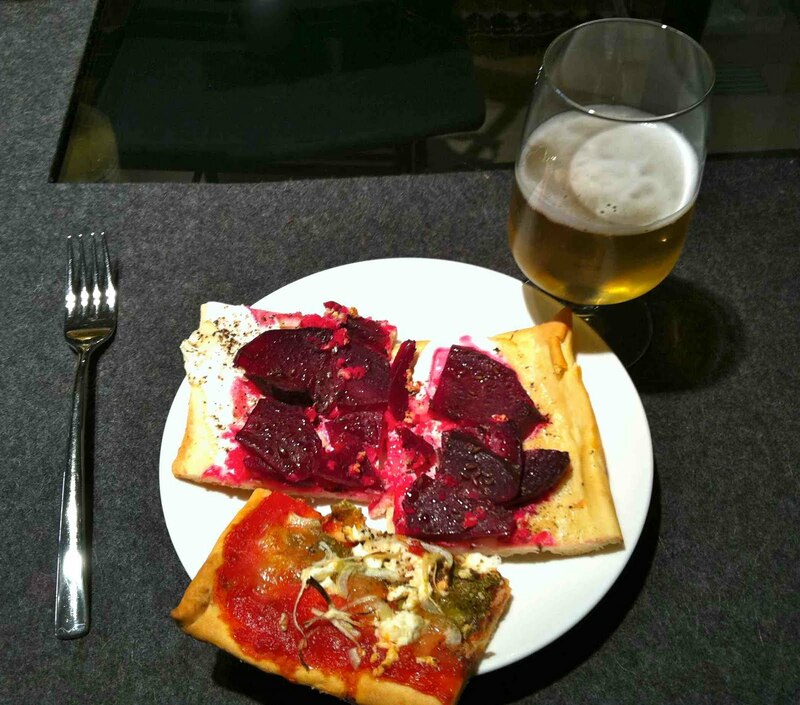 Beet Pizza and Beer … Yum! 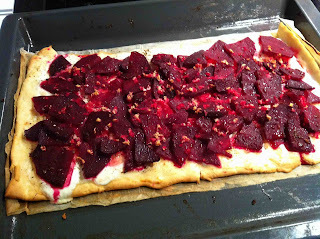 Then I spread the pizza with yogurt, placed thinly sliced onions and freshly ground horseradish on the yogurt, ground some pepper, then added the beets. On top I added a little more horseradish. In the oven for about 10 more minutes and voila! Hey! My word verification is “exces.” I think that’s appropriate. I miss my American GE oven and its 550°F heat. Twelve minutes for a pizza with crispy thin crust. Il Sestante is my favorite Vienna Pizzaria. I asked once if I could work there learning to make pizza … they said sure, 1000 Euros! Probably worth it.